this horse is a bay with a black and white. did you do that on paint? cause it looks kinda animated. But awesome job on it! It's beautiful! 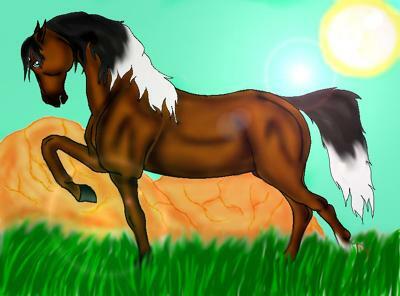 I have been painting horses in over 3 years but I can't be so good like you. That is weird. I don't remember adding that either. It's a mystery. But the picture is great!!! Yes, that is weird. I LOVE the drawing, though.